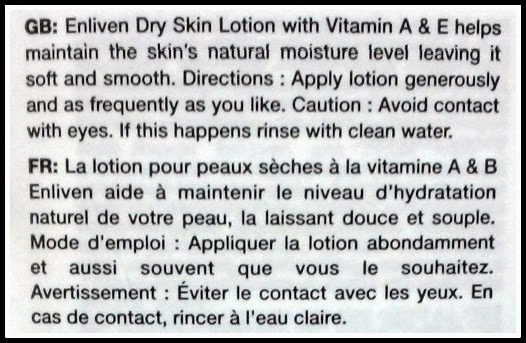 This is a review of Enliven Skincare Vitamin A & E Hand and Body lotion. 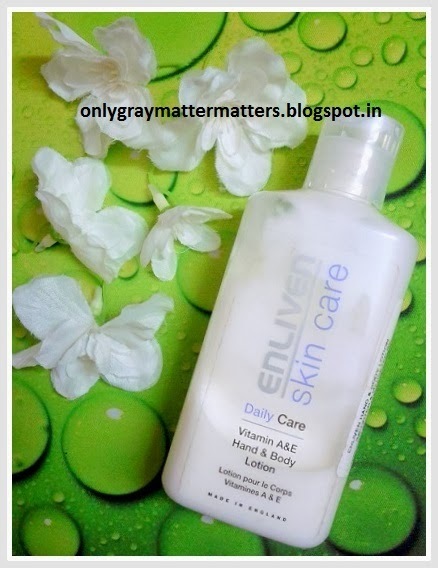 Enliven is a UK based brand and I had first heard about it in 2007 when I first saw their products in the Indian market. But at that time I had no information on this brand. I got to try some of their products last winters (beginning of 2013) when medplusbeauty.com was offering some enliven samples for every INR 500 of order value. Comes in a see-through white bottle. The packing is leak-proof but the 400 ml bottle looks tall and slender and might be a pain when it becomes light weight as you use more and more of the product. Caution: Avoid contact with eyes. If this happens, rinse with clean water. This lotion is non-greasy and light as it is water based and water is listed as the first ingredient. It is quite perfumed though the perfume is not bothersome. 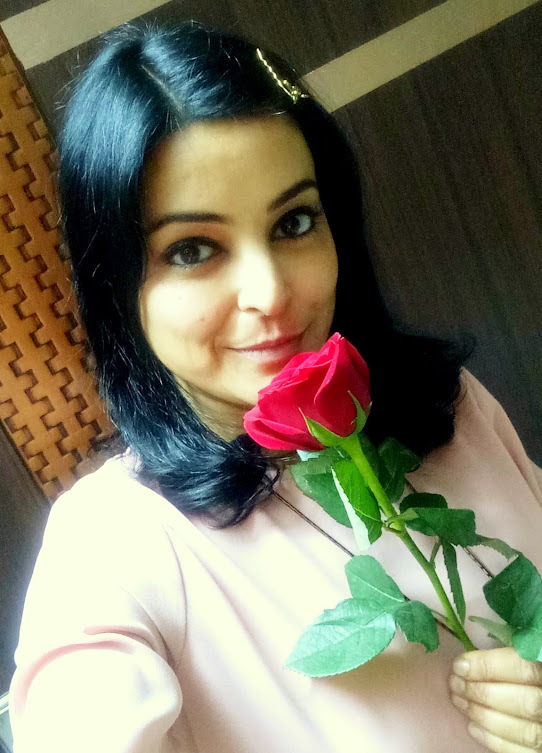 Though personally I prefer fragrance-free or natural fragrance to artificial one. The consistency is neither thick, nor runny - just perfect. It spreads easily on the skin and gets absorbed super quick within 10 seconds (if you can bear the wet feeling for that long) and you don't need to rub it in. Once it is absorbed, there is not a trace of oiliness. Even though the packaging says it is for dry skin, it does not moisturize my skin at all. Only my palms feel soft for some time but the skin on the arms remains dry. 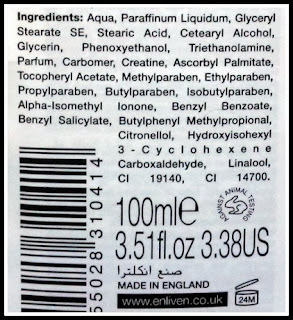 Enliven Vitamin A & E hand and body lotion is full of chemicals. There is a long list of preservatives, which is far more than what you usually find in other lotions. Paraffinum Liquidum, which is mineral oil, is the second ingredient and that just forms a coating on the skin to seal in the moisture. But if the skin is already dry from within, what moisture would it seal? I can forgive that as other body lotions also contain mineral oil. 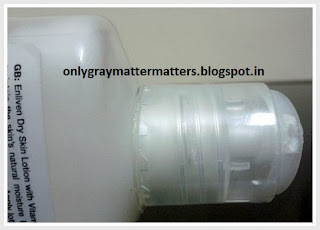 But, it also contains Triethanalomine which is not safe to be used on cracked and damaged skin. Aren't body lotions actually supposed to be used on such dry skin only? Then why use harmful chemicals in them? I hated the ingredient list so much, I never bothered to check what the other ingredients do. I also tried their shower gels and shampoos (again samples during medplus purchase). The shower gels were too soapy and the shampoos dried my hair. I now use them for washing my combs. 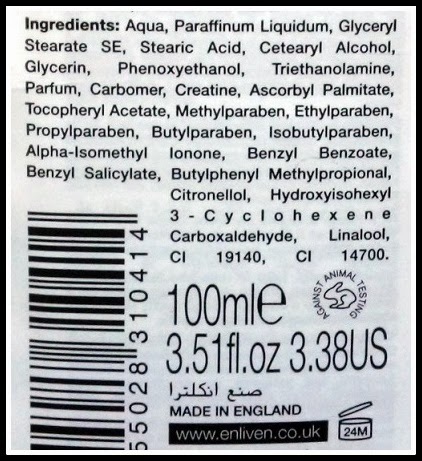 I would never purchase anything from this chemical factory again as I am all for natural skin-loving ingredients. 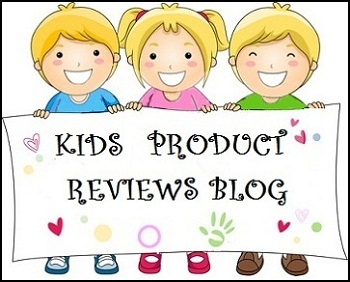 honest review as always.. i feel the same about this brand.!!! I have their other variant which is decently hydrating but yes, full of chemicals. Good that you bring that to our attention! I missed these posts as the festive season and preparations has taken a toll on my health. I hope you get well soon. Diwali actually means a lot of cleansing and decking up the house, so it is but natural to get exhausted though you don't feel it immediately because of the festival high.. plus the tricky weather. So the other variation does provide some hydration! hmmm, this one may work in autumn but no hydration even at the onset of winters, let alone the colder days.